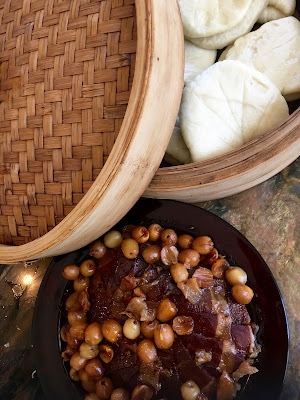 Lately I’ve been writing about some great meals I've eaten during my life, and my biggest and saddest realization has been that so many of the almost iconic and classical dishes of China's greatest food cultures have completely disappeared. And I cannot for the life of me figure out why. 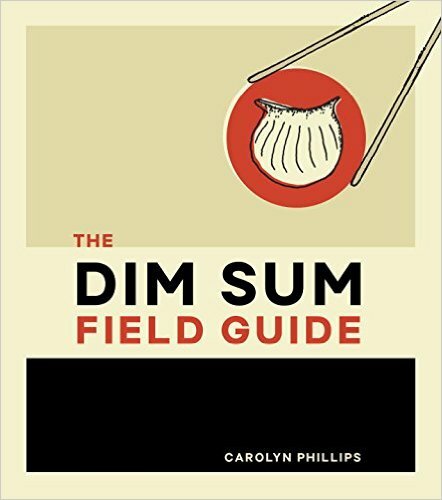 When I worked at the history museum and other cultural institutions in the early eighties, part of my job included interpreting at the various mainland-style restaurants the directors took foreign visitors to for lunch or dinner. One of the favorites was Peng’s Agora Garden (Péng yuán 彭園), a wonderful Hunan restaurant that gloried in the classics of this south-central province. Be that as it may, the crisp rinds acted as firm bowls, while the juices of their gentle jade flesh wove between the pork and aromatics into an exciting broth that turned preconceptions upside-down. Was this a fruit dish? Yes, but. And that got me to thinking about why we never see these amazing foods anymore, even in China. It’s all about street snacks and simple restaurant cooking nowadays, or chile peppers and Sichuan peppercorns, all of which I love… don’t get me wrong. 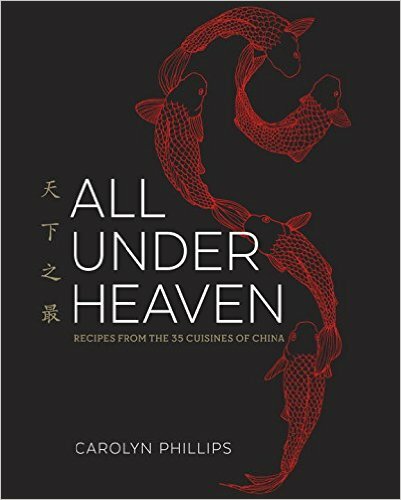 And yet, all of us – Chinese people included – are missing out on so much by concentrating on the dishes that are easy and accessible and overly seasoned. Take today’s recipe, for example. This blows peoples’ minds whenever I serve it. Thin slices of lovely cured pork are steamed with slab sugar and lotus seeds, and then served as little sammies with the caramelized sauce. It’s the perfect finale for a meal. And it’s ridiculously easy: assemble and steam. Perfection achieved. Why this isn’t known and beloved by every devotee of good cooking is beyond me. Perhaps it’s because Chinese ham can’t be imported. But then again, other types of cured pork can be used instead with great results. 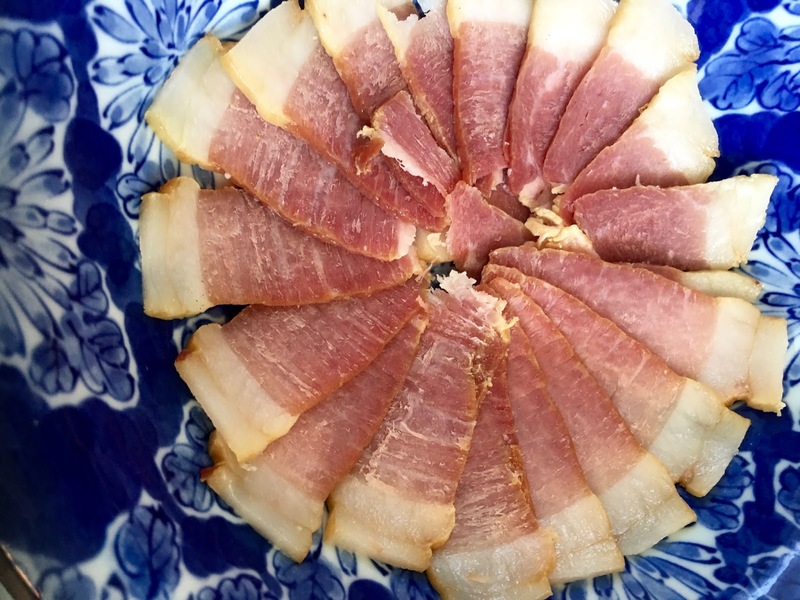 I’ve tried the gamut – prosciutto and Smithfield ham were obvious subs – but in the end I returned to Hunan and its long-term love affair with charcuterie for the perfect meat. 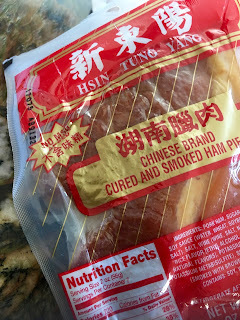 Smoked Hunan-style cured pork (Húnán làròu 湖南臘肉) works like a dream here. 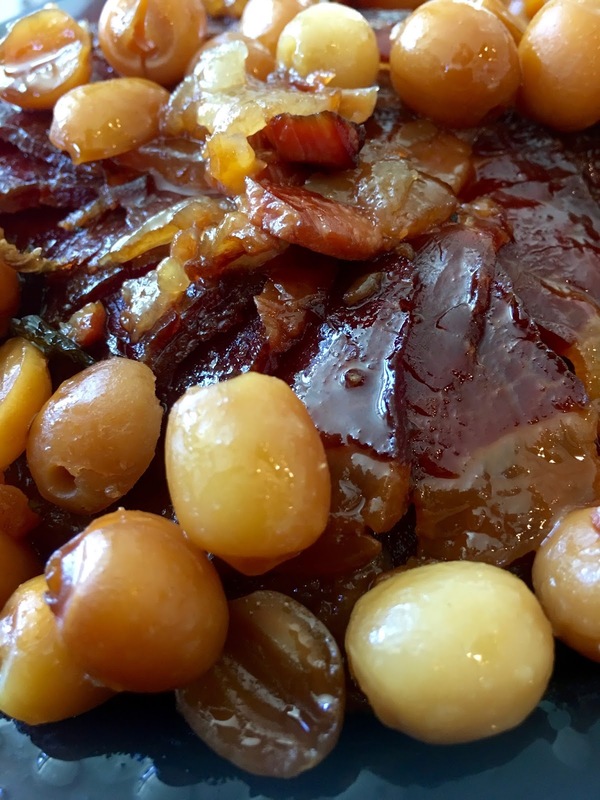 Unlike prosciutto or Smithfield ham, it is not too salty, and the flavor is subtle enough to offer the requisite balance of savory and the sweet in this dish. 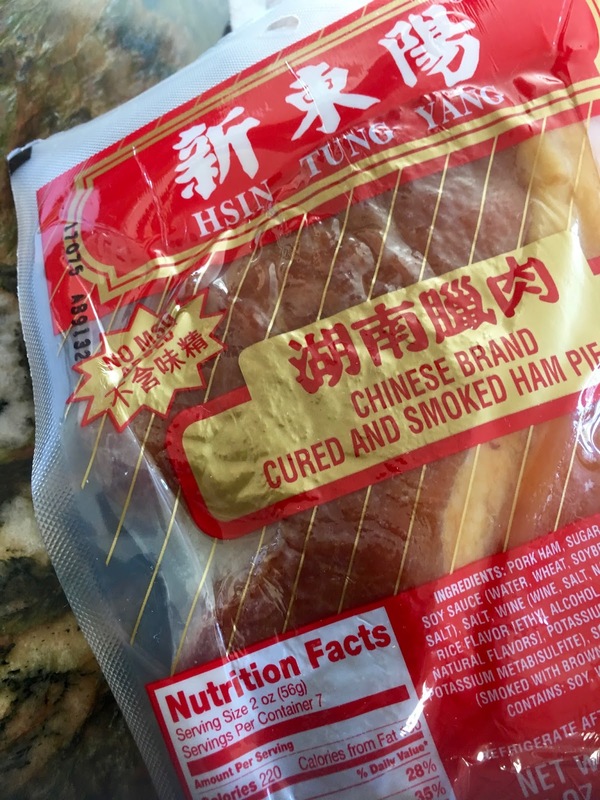 Two wonderful things about this cured pork is that a) it’s made in the U.S., and b) it’s available all year around in Chinese markets, where it is vacuum-packed in plastic. You don’t even need to refrigerate it until it’s opened, and so I tend to stock up on this whenever I find a great batch. What do you look for? Glad you asked. 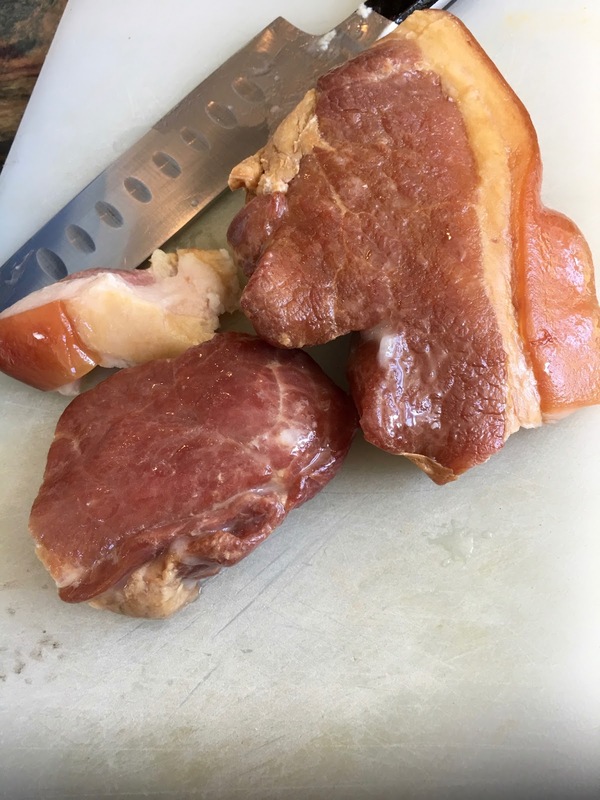 The commercial offerings of this type of charcuterie are generally taken from what appears to be the lower part of the ham, so that you get is basically lean meat with a nice fat layer under the skin. 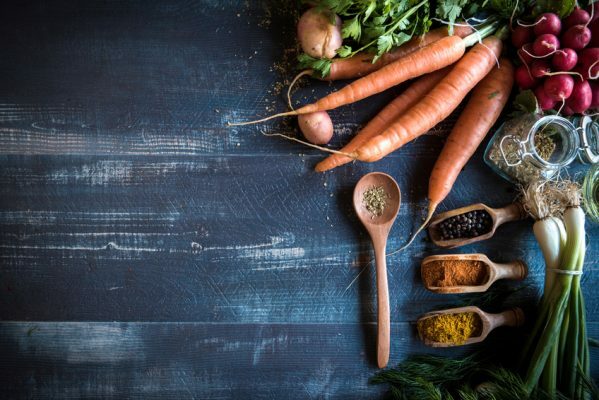 However, the meat often becomes chopped up in order to meet the package’s stated weight of 14 to 16 ounces, so you need to paw around to find one that fits the bill. I try to find whole pieces that are at least 3 inches (7.5 cm) wide and an inch (2.5 cm) thick. Make sure that they have a wide ribbon of fat on one end that is topped by the skin. You won’t be able to eat that skin, but it will contain lots of flavor, so don’t toss it out. 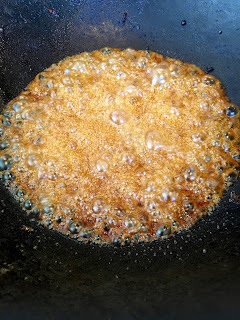 The same goes for the fat: it will help to make this dish divine. Lotus seeds are the traditional accompaniment to the ham, as is the rock sugar. But I have messed around with this a whole lot during the ensuing decades, trying to achieve some of that intense flavor and, yes, even sensuousness of the original dish. And I think I’ve succeeded here. You find a whole range of flavors popping up, other than the usual sweet and salty: Shaoxing rice wine, the gentle heat of ginger juice, and the caramel edge of the slab sugar combine to make this dish truly magical. Sandwich the meat inside some lotus leaf buns, drizzle on some of the sauce, and settle in for a luxurious meal. By the way, if you have a copy of All Under Heaven lying around the house, you already possess a recipe for honey ham. 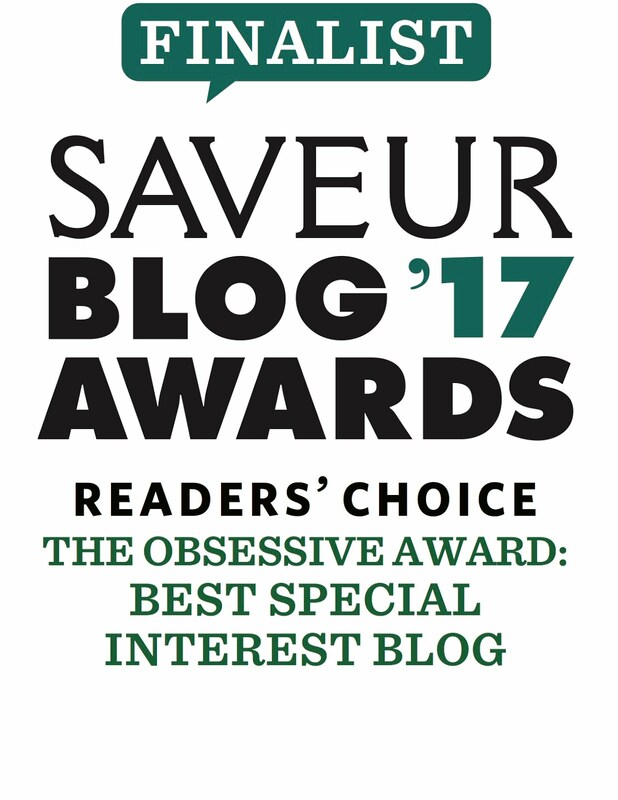 However, I’ve tweaked it a bit (I really can’t stop doing that – occupational hazard, I guess) so that it comes out even more luscious. Let me know if you agree! 1. For best results, start this recipe the day before you serve it so that the meat and lotus seeds have time to absorb the flavors of the sauce. This also makes your feast a whole lot more carefree. 2. Soak the lotus seeds in boiling water and then clean. 3. Remove the skin from the smoked pork and set it aside for later on in the recipe. Slice the meat against the grain into thin pieces, keeping as much fat on as possible, but removing any tough membranes. 4. Arrange the meat slices in an overlapping pattern in the center of a 4-cup (500 ml) heatproof bowl so they look like flower petals. Keep arranging the slices in the bowl in a flower pattern, and tossing any irregular scraps in the center, where they will be nicely hidden. Pile the cleaned lotus seeds on top. 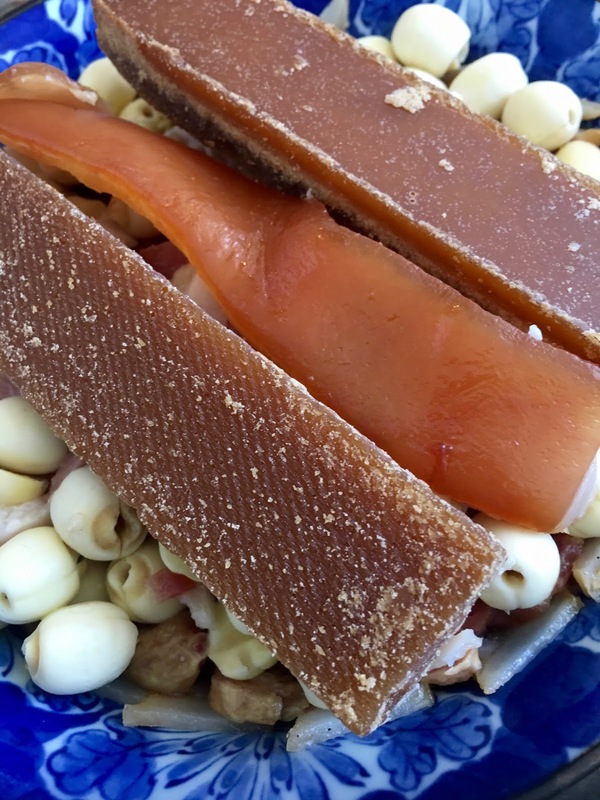 Arrange the 2 pieces of slab sugar on top of the ham, as well as the pork skin, and then pour the rice wine and ginger juice over everything. 5. Prepare a steamer and bring the water in it to a full boil. Place the plate in the steamer and steam for about 1 hour, until the meat is very tender and the lotus seeds are soft. Taste a lotus seed to ensure that it is cooked through. 6. For best results, let the bowl come to room temperature, cover, and chill overnight. About half an hour before serving, steam the bowl once more to heat it through, about 20 minutes. Remove the plate from the steamer and carefully pour the sauce off into a wok or pan. 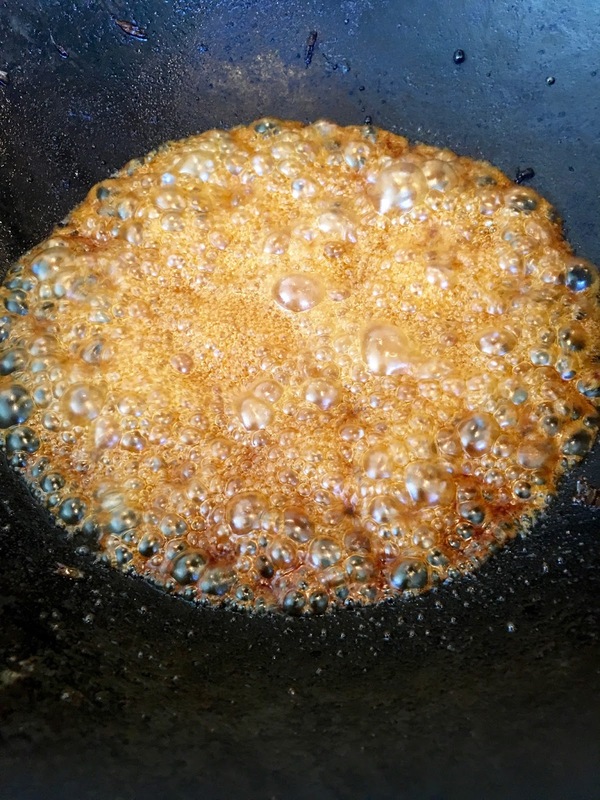 Bring the sauce to a boil and reduce it until it is thick and caramelized and bubbly. 7. Invert the pork onto a rimmed plate, arrange the lotus seeds around the edge, and then pour the sauce over the meat and lotus seeds. 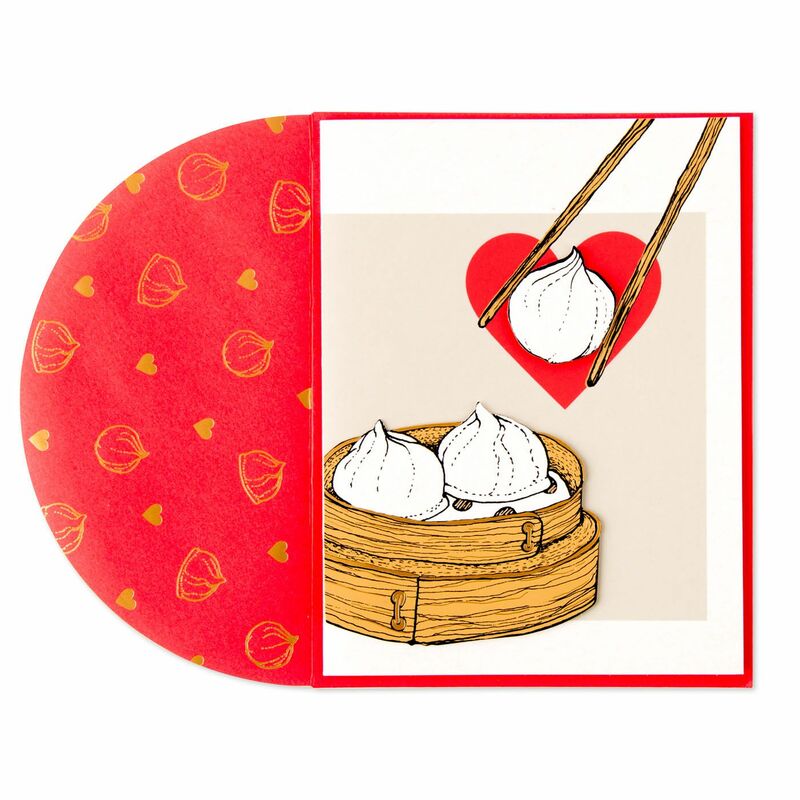 Serve with the hot steamed lotus buns. Have each diner open up a bun and insert a slice or two of the meat. These are to be eaten like tiny sandwiches; the lotus seeds can be picked up with chopsticks and eaten as a garnish. The Yunnan ham might work. First take a couple of nibbles to determine the salt content. If it's salty, you could slice it and blanch it before steaming it with the sugar. Let me know how it works out. I love all these food images. How did the ham turn out?